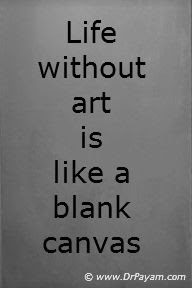 Life without art is like a blank canvas. Artists add color to our lives with the genius of their creativity. They inspire us, make us laugh, and add meaning to our lives. They also bring awareness to social justice issues that affect us all. Great literature, films, live performances, poetry, music, paintings, drawings, sculptures, documentaries, acting, comedy, blogging, fashion, design, photography, and other art forms come from the hard work of artists. Many of these artists sacrifice a secure, conventional lifestyle and go through a great deal of financial hardship in order to make art. Without their sacrifice, many great pieces of art would never be produced. Artists deserve appreciation for enriching our lives, but they are often criticized for their choice of career and for not flowing with the mainstream. Such lack of support can add more suffering to their lives. As an artist, you can benefit from understanding how to navigate the challenging journey of working in the creative field. There are many sources to aid in such understanding. One of the most accessible ways to build creativity is to listen to your own inner stories. Your inner stories can be found by paying attention to your inner dialogues or self talk, dreams you have at night, the contents of your fantasies and imagination, intuitive messages, and the sensations in your body. In this brief article, I will discuss how the way you relate to your art and your path as an artist can be influenced by your inner stories, and how working with them can add vitality to your artistic journey. It is best to approach your inner stories in the context of psychotherapy in order to avoid becoming overwhelmed by what you might encounter. A psychotherapist who has experience and training working with the art community can be helpful companion on your journey. Let’s start by bringing awareness to what you are telling yourself about your creative process. You might notice your internal dialogues consist of comparing yourself to others who are more successful. For example, when you say to yourself, “My work is not as good as my friend who just got a job as a staff writer for an HBO show,” you can discourage yourself from becoming a prosperous artist. Comparing yourself to others who are more successful in their artistic careers is a recipe for triggering feelings of internal shame and inadequacy. These feelings of inferiority can discourage you from pursuing your path as an artist. Everyone’s path is unique, and there is no need to compare yours to others. Your mind, like the magic lamp, can be illuminated by the creativity of your inner genie. But your creative genie can stay locked up inside your pessimistic self talk if you don’t stop the negative chatter box. Be creative with how you deal with discouraging negative self talk. You can find inspiration in the story of Aladdin and the Magic Lamp when it comes to dealing with life’s obstacles. As soon as you notice your negative dialogue, say, “Abracadabra,” and let the genie out of the bottle of pessimistic story-making. Do some sort of creative work or say positive affirmations about your creative career. Like Aladdin, turn your life into an amazing odyssey and defeat the sorcerer of negative thinking. Sometimes the habit of negative self talk has to do with a deeply held belief system that you acquired as a result of growing up in a less-than-optimal family environment. With a help of an experienced therapist, you can uncover the root of such dysfunctional belief systems that give rise to negative self talk and undermine your confidence in your career as an artist. A powerful source of self-understanding and becoming a more conscious artist can come from paying attention to the dreams you have at night. Some of your dreams can shed light on your struggle with your creative career. When you wake up in the morning, write down what you dreamt about in your dream journal. By analyzing your dreams with the help of a trained person, you can learn about the content of your unconscious. Working with the unconscious is important because within the unconscious resides creative potential and the answers to many of your life’s mysteries. Dream work can also deepen your relationship with yourself. It is an important way to honor your unconscious. Inner Work, a book by Robert Johnson, is inspired by Carl Jung’s teachings and describes a helpful process of how to understand dreams. Many people have found this book to be a helpful introduction to working with the unconscious. How you fantasize and imagine your place in the world of art is going to impact your relationship to your creative career. This relationship can be contaminated by the images of failure you might hold in your mind about your journey as an artist. You need your imagination to help you create art – not fear. Using your imagination to worry about your creative path is not the best use of your creativity. Practice mindfulness as a way to avoid getting caught in the negative contents of your mind. In the 1960s, Thich Nhat Hanh brought mindfulness to the attention of Westerners. A variety of mindfulness practices exist today. Many of them were inspired by teachings from the East. For the most part, mindfulness involves bringing your complete attention to your present experience on a moment-to-moment basis with acceptance and compassion. Using mindfulness, you can observe your physical, emotional, and mental experiences with kindness. You pay attention to whatever is happening in the moment, and you can use your sensory awareness to stay fully present. For example, when you wash the dishes, you can see and feel the soapy water on your hands. Taking a walk and noticing without judgment how life unfolds around you is another simple mindfulness practice. You can attend classes at UCLA Mindfulness Awareness Research Center (www.marc.ucla.edu) to learn more about mindfulness. The more you avoid getting entangled with the negative images and fantasies about your career, the more serenity you can experience on your journey toward becoming an accomplished artist. There are times when, with help of an experienced guide, you can engage your imagination and have a dialogue with the images that come up for you. For some artists, it is necessary to understand the images that come from the inner world, which can help to know the self. Consciously dialoguing with the images of the unconscious is part of a process called ‘active imagination’. In his book, Memories, Dreams, Reflections, Carl Jung provided an inside view of his own experience with active imagination. Jung had conversations with inner figures he encountered during the practice of active imagination, which felt intense yet enlightening for him. Intuitions are also part of your inner stories, and they can guide you on your art-making path. The key is to not confuse intuitive messages with negative thinking. They come from different sources. Negative thoughts often come from an insecure place in your mind that needs healing. Intuition comes from a deep place inside you that is connected to a power greater than yourself. Everyone can improve his or her ability to receive guidance from the sacred place inside. A powerful practice for developing your intuition is meditation. When you quiet your mind, paying attention to your breathing and relaxing your body, you knock on your inner door. A door will open, and you can enter in a meditative space. In that quiet space, you are detached, listening to the song of stillness. You are experiencing a deep silence which purifies your mind. The more you visit this space, the more you can cleanse your mind. With each visit to your meditative space, you enter deeper and deeper into your soul. You get closer and closer to your real essence. Meditation can lead to finding your true voice and positively impact the way you relate to your art. Your body never lies, and that is why it is important to pay attention to the sensations in your body. Your relationship to your artistic career can be experienced as bodily sensations. These sensations, like a story, can range from neutral and comforting to tense and distressing. As you think about your career path, you might notice tension in your body. Some people might sense tension in their shoulder or neck areas. By paying too much attention to distressing sensations in your body, you make yourself feel worse. One way to create more serenity in your body is to make neutral or pleasant sensations your total focus. The more you focus on the part of your body that is neutral or pleasant, the less you energize the distressing sensations. Somatic psychotherapy offers many tools that can help you work with the sensations in your body and liberate yourself from being trapped in negative bodily sensations. One must always check with his or her physician to rule out any underlying medical problems for distressing bodily sensations. Finally, there are times when, no matter how hard you work as an artist, your art cannot support you in making a decent living. This is not an uncommon situation. Many artists use their non-art-related skills to support themselves. The need to support yourself and the need to fulfill your creative destiny do not need to be in conflict. Creating an opposition between these two legitimate needs is not helpful. You can make room for both of them in your life and let them work side by side to get you closer to the vision you have for your artistic career. It takes a great deal of patience, discipline, and good time management to work in a non-art-related profession while making time to follow your dream. It helps to be part of a supportive community of artists that help each other not feel alone in such journey. As a community, artists can unite, advocating that more funds and resources be made available to them to create art that ultimately enriches everyone’s lives.